MARGARET KILLJOY is a transfeminine author, born and raised in Maryland, who has spent her adult life traveling with no fixed home. A life on the road has given her a healthy respect for hobos, street kids, and other elements of the criminal class. A 2015 graduate of Clarion West, Margaret’s short fiction has been published by Tor.com, Strange Horizons, Vice’s Terraform, and Fireside Fiction amongst others. She founded SteamPunk Magazine in 2006, and her nonfiction books have been published by anarchist publisher AK Press. Margaret’s wrote A Country of Ghosts, a utopian novel published by Combustion Books in 2014. She is also the author of the Danielle Cain series, starting with The Lamb Will Slaughter the Lion, from Tor.com Publishing. ELLEN KLAGES is the author of two acclaimed historical novels: The Green Glass Sea, which won the Scott O’Dell Award, and the New Mexico Book Award; and White Sands, Red Menace, which won the California and New Mexico Book awards. Her story, “Basement Magic,” won a Nebula Award and “Wakulla Springs,” co-authored with Andy Duncan, was nominated for the Nebula, Hugo, and Locus awards, and won the World Fantasy Award for Best Novella. She lives in San Francisco, in a small house full of strange and wondrous things. KAI ASHANTE WILSON was the 2010 Octavia Butler scholar at Clarion writing workshop in San Diego. He won the Crawford award for best first novel of 2016, and his works have been shortlisted for the Hugo, Nebula, Shirley Jackson, Theodore Sturgeon, Locus, and World Fantasy awards. Most of his stories can be read at Tor.com, and the rest at Fantasy-magazine.com or in the anthology Stories for Chip. His novellas The Sorcerer of the Wildeeps and A Taste of Honey are available from all fine e-book purveyors. Kai Ashante Wilson lives in New York City. JY YANG is the author of The Black Tides of Heaven and The Red Threads of Fortune. They are also a lapsed journalist, a former practicing scientist, and a master of hermitry. 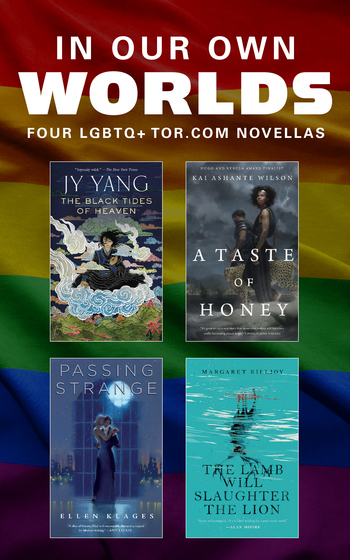 A queer, non-binary, postcolonial intersectional feminist, they have over two dozen pieces of short fiction published. They live in Singapore where they work as a science communicator, and have a MA in creative writing from the University of East Anglia. Find out more about them and their work at jyyang.com.